Put on cat videos for your feline friend when you leave the house. Sounds funny doesn’t it? I must admit when I first heard about videos that were especially designed to keep cats amused when they were left alone a rather strange idea. But then I thought about it and decided that if humans get bored and lonely then why not cats? These days most of us have to go out to work and if you have a cat that lives only inside then they will be left alone for long periods of the day, every day. I know for a fact that our cats hate to be left alone for too long. They actively seek us out in the home and love to be with us rather than sit on their own. So it makes sense that while we are out that they would become lonely. Some cats can actually become anxious if they are left alone for too long. this can lead to destructive behaviour such as scratching furniture and even messing in the home. What Do Cat Videos Do? 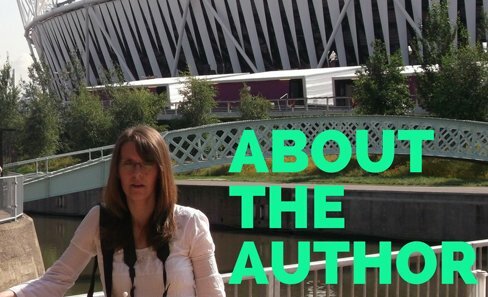 Here is a short clip of the sort of images shown on the cat sitter videos. You have seen your cat watching the birds in the trees and the fish in the pond haven't you? Well these videos basically provide your cat with the same experience. But they are far more vidid as they have a louder sound track and a more varied visual and changing picture. The idea is that while you are out and your cat is left in the house on their own, you can keep your cat entertained and less likely to get bored and become destructive. reducing the chance of your cat scratching the furniture and getting into mischief. The videos contains scenes of various creatures such as birds, squirrels, insects and many others which will give your cat that sense of hunting excitement they get when they are outside. Where Can You Buy Cat Videos? 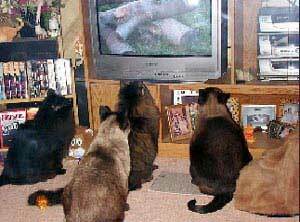 Pet Videos and DVD’s are mainly available from online cat supply stores. I have never seen them in the shops. 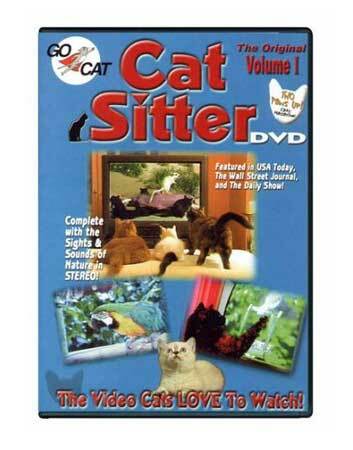 The most popular video I have come across is called cat sitter, which contains videos of birds and fish etc. Keeps the cats watching for ages. Click on the picture to find out more about this cat sitter video.